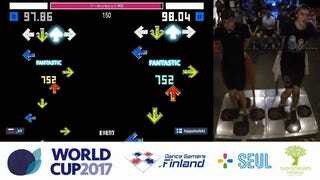 Markus “Hippaheikki” Kokkonen just secured a second first-place finish in this year’s In The Groove World Cup. The Finnish dance gamer is a well-known champion in Europe’s In The Groove scene, having placed first in the Doubles tournament at last year’s EuroCup. He scored first in yesterday’s Doubles tournament at the World Cup. There are three cup trophies to take home, and Hippa has already guaranteed two will be in his suitcase. Today, Hippaheikki secured the top slot in the Precision tournament, and tomorrow, he’ll be going for the gold in the World Cup’s Endurance tournament, the third and final cup available to win at the event. In his post-match interview on the tournament’s Twitch stream, he noted that Endurance was the cup he had planned to win: “I’ve trained so hard, for Endurance especially.” At this rate, Hippa may take home all three winner’s cups. Over the course of the Precision competition, Hippa achieved multiple 100% finishes—a perfect score, also called a “quad” because it awards the player four stars. He achieved one of these quads in the first of the semi-final rounds, making the score all the more impressive given how much he had already been dancing, and how much further he had left to go before securing his win. With the In The Groove World Cup 2017 being hosted in Helsinki, Finland, local fans delighted in seeing Hippa take home two top prizes so far. The second and third place finishers, who hail from Russia and from the UK, had devoted fanbases cheering them on remotely during the live Twitch stream as well. Omar Ambrose of Great Britain took home the bronze medal. The UK player turned out some very close scores this year, some of which resulted in recalculations from the judges due to concerns about the dance pad not registering Omar’s hits. Even with the judges rounding up some of Omar’s more questionable scores, however, Russian newcomer _69 still slid into a surprising second place. Meanwhile, the lower bracket for Precision players also featured some fun matches, most notably the solid performances by Simeoni “Blackrainer” Kangasmaa, a Finnish player who doesn’t use the bar on the back of the dance pad. Blackrainer ended up placing fourth in the lower bracket overall, but since he’s the only high-level player who doesn’t hold onto the bar while he plays, his performance is all the more thrilling. Tomorrow, the Endurance tournament will unfold on the Finnish “Dance Games” Twitch channel and determine whether Hippa will take home three cups or be unseated by another competitor. Next year, Finland will be passing the torch for hosting the In The Groove World Cup to another country, yet to be determined. _69 emphasized in his post-match interview that he hopes Russia will play host to more international dance game tournaments in the future, and given Russia’s stellar performance in the World Cup this year, Moscow could end up being next on the docket.